This collection of Fall activities for toddlers will keep your one, two or three year old busy! Fall is one of my favorite seasons! The colors are beautiful, the weather is perfect and there are so many great Fall crafts and Fall activities for toddlers that you can do! 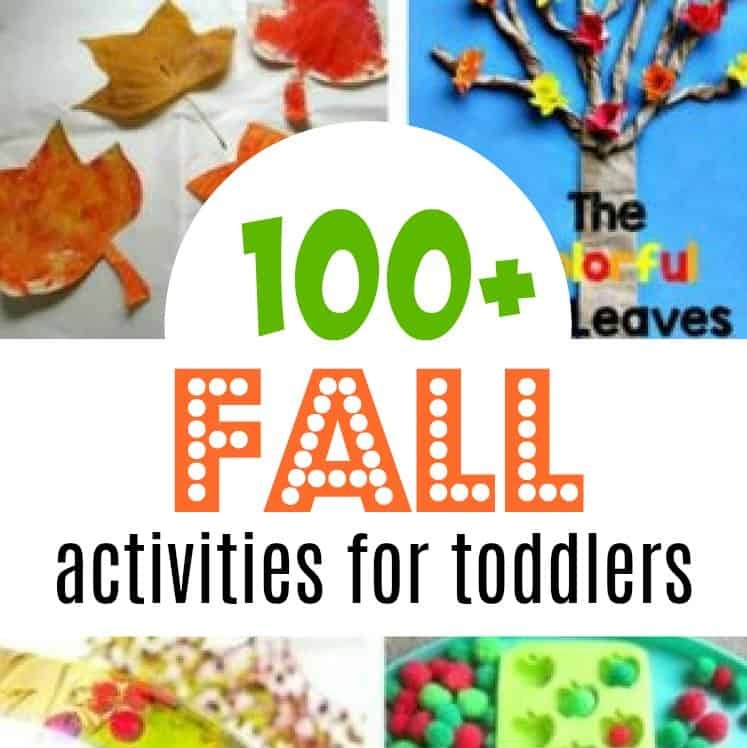 If you’re looking for Fall themed crafts, activities and sensory play then this collection of over 100 Fall Activities for toddlers will have you covered! Honestly, you have no excuse now! Whenever a new season arrives, I love to stock up on all of my themed craft supplies. It makes all of these activities so much easier when you have a good collection of supplies at hand. I don’t spend a lot, and most of these are only a few dollars each. These perfectly complement my toddler craft box which has all of my essentials as well. This collection of Fall craft activities will keep you’re 2 or 3 year old entertained for a LONG time! 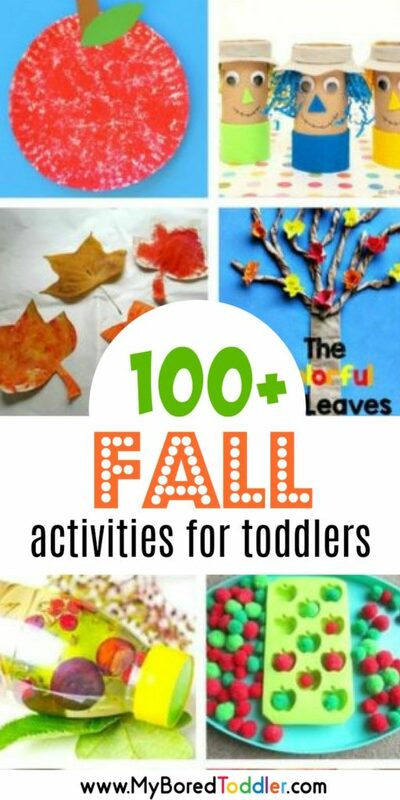 Containing crafts like apple rubbings, leaf paintings, wreaths and nature crafts, you can find over 40 Fall Craft ideas for toddlers HERE. Along with crafts, I love creating sensory play activities for the Fall season and we’ve found some of the best sensory play ideas. There are over 60 easy and fun toddler sensory play ideas that are just perfect for Fall HERE. 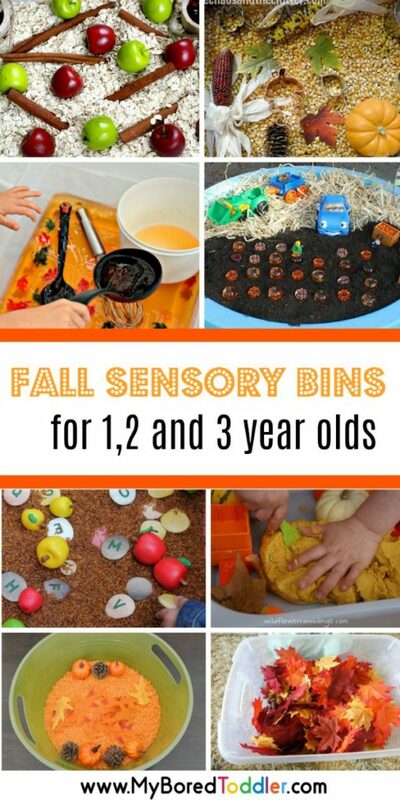 If that’s still not enough, we have a great collection of Fall themed sensory bins for toddlers. You’ll never run out of toddler Fall ideas again! You can find our huge collection of Fall themed sensory bins for toddlers HERE. Do you associate Fall with apples like I do? 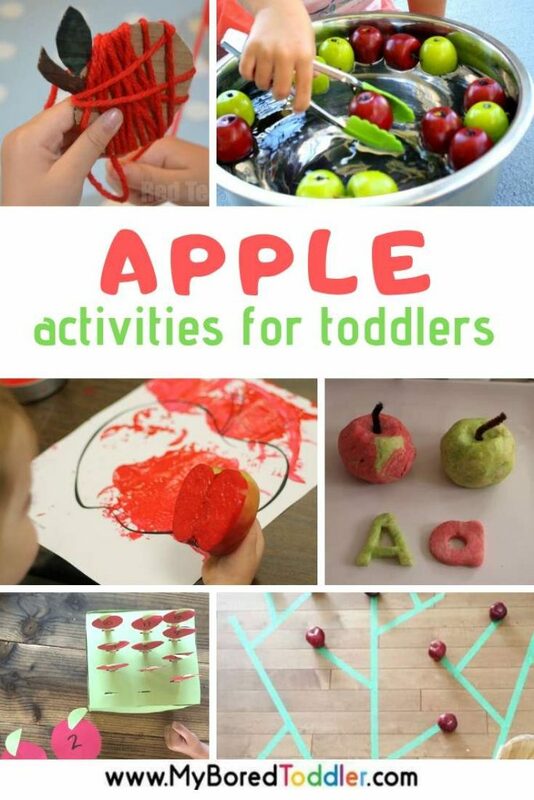 Check out all of our apple themed toddler crafts and activities HERE. I hope you enjoy all of these toddler Fall activities! Make sure you share photos of your toddler fall crafts and activities in our Facebook Group or over on Instagram – Use #MyBoredToddler so we can see! You can also sign up to our weekly newsletter or follow us on Facebook or Pinterest for more great toddler activities and ideas. Looking for Halloween ideas? See our Halloween collection HERE.